With globalization and liberalization came the mighty onset of Multi-National Companies with the power and resources to wipe out local domestic players. In this game of “David Vs Goliath”, how do the local domestic players succeed in holding their forte, and compete with limited resources and talent? Traditionally marketing and advertising in small local companies have been handled by one of the members in the firm with at the most some local ‘amateurish’ help. They would sit and brain storm amidst them-selves on how they feel could be the best way to utilize the shoe-string budget that had been allocated to them to maximize returns. Coming from a region in India with a large number of ‘family-run’ businesses and where people thought it was a shame to not be able to be one’s own boss, I have had the opportunity to observe a number of such small businesses including my own. Most of these businesses have existed for more than 40 years with the 3rd of 4th generation of family members now looking after the business. There was earlier a generation of people who believed that advertising was a way of “blinding” customers to other critical factors such as quality and value. They felt that advertising was necessary only for companies and industries that were not confident of their quality and ability to get customers to purchase their product. Over time, they faced the consequences of this line of thought and lost market share to other domestic players. So thinking on these lines, this brings me to the question, “With excellent advertising, is it possible to get the customer to buy anything?” Is quality only a perceived parameter that can be driven into the customer with the right kind of advertising? If so, is it wise or necessary to spend on quality improvement programs like TQM, Six Sigma and Quality Control measures? Wouldn’t it make more sense to have a product that “just manages” to satisfy the customer and divert the funds that would have been used to make a “high quality” product towards advertising and hence increase the “perceived value of quality” from the customer. I take a break from this line of thought to bring to the front the scenario most of these small firms are in today. With the advent of multi-nationals who have “bottom-less” pockets when it comes to the sizes of their advertising budgets and their expenses on Research and Development. They can bring out the best of both worlds driving towards achieving both physical quality and spending on advertising towards increasing the value of perceived quality to the customer. But what does the customer want? Does he want to be delighted every time and in every product? I don’t think so! When we go to the super market to pick up a tube of toothpaste, we don’t expect the product to delight us every time we use it to brush our teeth; we want to ensure that the toothpaste satisfies basic factors such as fresh breath and anti-bacterial protection amongst others. We are not concerned and we don’t even know if the next time we buy the toothpaste; it is able to fight germs even better! The initial reaction of all of these small firms to compete with global players has been to increase spending on their Research and Development to be able to compete on “physical quality” of their product hoping that it would make them more competitive and then strain their cash flows by pushing what little they have remaining to advertise on less main-stream modes such as posters, radio and promotional items. There has been a tendency to focus on constantly coming up with promotional items such as “free gifts” and also competing largely on price. They have been forced to reduce prices oblivious to the fact that getting into a price war with the “Goliaths” is the last thing that they can afford to do as that would be the first step towards digging their own grave. I have seen a number of such firms fall from their position as market leaders or being acquired by the large firms over the years. So how do they compete? Apart from a numerous other methods available such as niching, positioning and all of the “Porter-jargon”, I feel that there can be a trade-off made between “physical quality” and “perceived quality” that can enable these firms to compete with the giants. So where lies this point? We can study the same from the diagram below comparing “physical quality” and “perceived quality”. The Graveyard – This is the term I have used to refer to firms that are both low on physical quality and on perceived quality. The firms in this region of the matrix will die a natural death over time. The Bleeding Sheep – These are firms that are high on physical quality and low on perceived quality. These firms are those which still believe that quality sells itself and are heavily investing in improving their quality of their product without being able to communicate the same to the customer. They feel that the solution to their dropping market share should be to further spend on improving the “physical quality” of their product. They are the bleeding sheep because they are slowly bleeding to death as their cash flows are highly constricted and I also refer to them as sheep as they try to replicate all the methods and processes used by the multi-nationals. The Goliath – This positioning is where most of the multi-nationals armed with deep “war chests” are positioned. While they are constantly spending towards improving their ‘physical quality’ by means of Research and Development and Process Improvement Programs, they are also constantly communicating their high level of quality to the consumer thus raising the perceived value of the product in the minds of the customers. This is where ever firm – small or large aims and dreams to be. 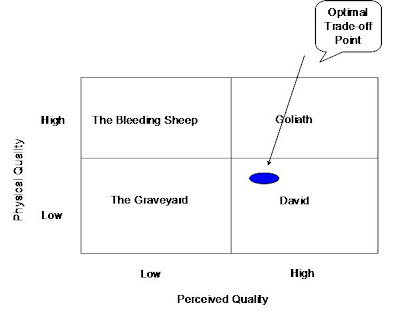 The David(s) – This segment of the matrix represents firms with a low level of “physical quality” and a high level of “perceived quality”. I would like to bring to your attention that when I mean a “low” level of physical quality, I am referring to a threshold level of quality which translates to the customer just being satisfied rather than being delighted and excited to hold your product. This is my recommended positioning for small firms to compete with the large MNCs. The blue circle is the optimal trade-off point that I recommend small firms should position themselves – being a product that satisfies the consumer but working towards increasing the “perceived value” of the product in the minds of the consumer. Increasing the “perceived value” of the product in the minds of the consumer can be done with focussed advertising. The company should divert the funds that it would have allocated towards increasing the “physical quality” of the product in terms of capital expenditure, process improvement programs and promotional items towards highly focussed advertising communicating quality to the consumer. Focussed advertising could be in terms of geography or target market. If in case of geography, it could be in terms of first fortifying its base in its home market regionally before it goes on towards advertising in newer markets. Focussed advertising is a very important aspect in this strategy as the advertising budget that these firms is not enough to compete nationally or globally with the “Goliaths” and hence they should focus all of their resources towards maximizing results. Once, these actions begin to translate into increased market share, these firms can choose to expand into newer markets following the same strategy and when their cash flows are strong, they can consider spending towards increasing the value of “physical quality” of their product. This would help them to move into the “Goliath” segment and then they will be a force to reckon with. While writing this article, I have mainly used products to validate my arguments and have not yet considered the applicability of this matrix and approach to the services sector. The matrix will change for the services sector as in that case the “physical quality” is too closely linked to the “perceived value” of quality. For example, people from South India may have heard of VVD Coconut Oil. For the benefit of others, Coconut Oil is used in India on the hair as one would use a hair cream. VVD Coconut Oil has successfully positioned itself as a force to reckon with in its home turf and has defended its position against “Parachute” which is a national brand from the house of Marico. The processes that VVD uses towards achieving “physical quality” is not as mature and developed as that of Parachute and so is the same with the expenditure on Research and Development, but VVD has successfully communicated its “perceived value of quality” through the times to the customer in its home turf by means of focussed advertising. Try to think of any consumer product that you know is strong or weak regionally and fit it into the boxes and you will see that this model can be validated. There may me many ways for small firms to compete with the large giants and this article tries to highlight one of the ways. What is most important is for the smaller firms to acknowledge that they are not in a position to be able to compete with the MNCs in all aspects and hence they should identify and recognize their areas of competence and try to study if improvement in that facet could lead to improving their market share. If their findings indicate that it could lead to an improvement in market share, they should choose to focus a maximum portion of their resources towards their competency. This could make them all the more competitive. Remember that everyone likes the underdogs and even in the story of David and Goliath, everyone roots for David! Try to use this to pull the market into your favour. Falling down is not defeat…. Defeat is when you refuse to get up.